Cloud chamber photograph by C. D. Anderson of the first positron ever identified. A 6 mm lead plate separates the upper and lower halves of the chamber. The deflection and direction of the particle's ion trail indicate the particle is a positron (see below). The positron or antielectron is the antiparticle or the antimatter counterpart of the electron. The positron has an electric charge of +1e, a spin of ½, and has the same mass as an electron. When a low-energy positron collides with a low-energy electron, annihilation occurs, resulting in the production of two or more gamma ray photons (see electron–positron annihilation). Positrons may be generated by positron emission radioactive decay (through weak interactions), or by pair production from a sufficiently energetic photon which is interacting with an atom in a material. In 1928, Paul Dirac published a paper proposing that electrons can have both a positive charge and negative energy. This paper introduced the Dirac equation, a unification of quantum mechanics, special relativity, and the then-new concept of electron spin to explain the Zeeman effect. The paper did not explicitly predict a new particle, but did allow for electrons having either positive or negative energy as solutions. The positive-energy solution explained experimental results, but Dirac was puzzled by the equally valid negative-energy solution that the mathematical model allowed. Quantum mechanics did not allow the negative energy solution to simply be ignored, as classical mechanics often did in such equations; the dual solution implied the possibility of an electron spontaneously jumping between positive and negative energy states. However, no such transition had yet been observed experimentally. He referred to the issues raised by this conflict between theory and observation as "difficulties" that were "unresolved". Dirac wrote a follow-up paper in December 1929 that attempted to explain the unavoidable negative-energy solution for the relativistic electron. He argued that "... an electron with negative energy moves in an external [electromagnetic] field as though it carries a positive charge." He further asserted that all of space could be regarded as a "sea" of negative energy states that were filled, so as to prevent electrons jumping between positive energy states (negative electric charge) and negative energy states (positive charge). The paper also explored the possibility of the proton being an island in this sea, and that it might actually be a negative-energy electron. Dirac acknowledged that the proton having a much greater mass than the electron was a problem, but expressed "hope" that a future theory would resolve the issue. Robert Oppenheimer argued strongly against the proton being the negative-energy electron solution to Dirac's equation. He asserted that if it were, the hydrogen atom would rapidly self-destruct. Persuaded by Oppenheimer's argument, Dirac published a paper in 1931 that predicted the existence of an as-yet unobserved particle that he called an "anti-electron" that would have the same mass as an electron and that would mutually annihilate upon contact with an electron. Feynman, and earlier Stueckelberg, proposed an interpretation of the positron as an electron moving backward in time, reinterpreting the negative-energy solutions of the Dirac equation. Electrons moving backward in time would have a positive electric charge. Wheeler invoked this concept to explain the identical properties shared by all electrons, suggesting that "they are all the same electron" with a complex, self-intersecting worldline. Yoichiro Nambu later applied it to all production and annihilation of particle-antiparticle pairs, stating that "the eventual creation and annihilation of pairs that may occur now and then is no creation or annihilation, but only a change of direction of moving particles, from past to future, or from future to past." The backwards in time point of view is nowadays accepted as completely equivalent to other pictures, but it does not have anything to do with the macroscopic terms "cause" and "effect", which do not appear in a microscopic physical description. Dmitri Skobeltsyn first observed the positron in 1929. While using a Wilson cloud chamber to try to detect gamma radiation in cosmic rays, Skobeltsyn detected particles that acted like electrons but curved in the opposite direction in an applied magnetic field. Likewise, in 1929 Chung-Yao Chao, a graduate student at Caltech, noticed some anomalous results that indicated particles behaving like electrons, but with a positive charge, though the results were inconclusive and the phenomenon was not pursued. Carl D. Anderson discovered the positron on August 2, 1932, for which he won the Nobel Prize for Physics in 1936. Anderson did not coin the term positron, but allowed it at the suggestion of the Physical Review journal editor to which he submitted his discovery paper in late 1932. The positron was the first evidence of antimatter and was discovered when Anderson allowed cosmic rays to pass through a cloud chamber and a lead plate. A magnet surrounded this apparatus, causing particles to bend in different directions based on their electric charge. 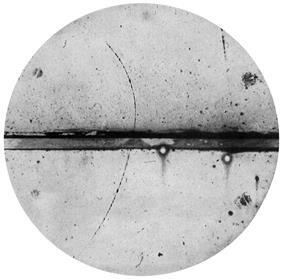 The ion trail left by each positron appeared on the photographic plate with a curvature matching the mass-to-charge ratio of an electron, but in a direction that showed its charge was positive. Anderson wrote in retrospect that the positron could have been discovered earlier based on Chung-Yao Chao's work, if only it had been followed up. Frédéric and Irène Joliot-Curie in Paris had evidence of positrons in old photographs when Anderson's results came out, but they had dismissed them as protons. Positrons are produced naturally in β+ decays of naturally occurring radioactive isotopes (for example, potassium-40) and in interactions of gamma quanta (emitted by radioactive nuclei) with matter. Antineutrinos are another kind of antiparticle created by natural radioactivity (β− decay). Many different kinds of antiparticles are also produced by (and contained in) cosmic rays. Recent (as of January 2011) research by the American Astronomical Society has discovered antimatter (positrons) originating above thunderstorm clouds; positrons are produced in gamma-ray flashes created by electrons accelerated by strong electric fields in the clouds. Antiprotons have also been found to exist in the Van Allen Belts around the Earth by the PAMELA module. Antiparticles, of which the most common are positrons due to their low mass, are also produced in any environment with a sufficiently high temperature (mean particle energy greater than the pair production threshold). During the period of baryogenesis, when the universe was extremely hot and dense, matter and antimatter were continually produced and annihilated. The presence of remaining matter, and absence of detectable remaining antimatter, also called baryon asymmetry, is attributed to CP-violation: a violation of the CP-symmetry relating matter to antimatter. The exact mechanism of this violation during baryogenesis remains a mystery. Positrons production from radioactive β+ decay, can be considered both artificial and natural production, as the generation of the radioisotope can be natural or artificial. Perhaps the best known naturally-occurring radioisotope which produces positrons is potassium-40, a long-lived isotope of potassium which occurs as a primordial isotope of potassium, and even though a small percent of potassium, (0.0117%) is the single most abundant radioisotope in the human body. In a human body of 70 kg mass, about 4,400 nuclei of 40K decay per second. The activity of natural potassium is 31 Bq/g. About 0.001% of these 40K decays produce about 4000 natural positrons per day in the human body. These positrons soon find an electron, undergo annihilation, and produce pairs of 511 keV gamma rays, in a process similar (but much lower intensity) to that which happens during a PET scan nuclear medicine procedure. Satellite experiments have found evidence of positrons (as well as a few antiprotons) in primary cosmic rays, amounting to less than 1% of the particles in primary cosmic rays. These do not appear to be the products of large amounts of antimatter from the Big Bang, or indeed complex antimatter in the universe (evidence for which is lacking, see below). Rather, the antimatter in cosmic rays appear to consist of only these two elementary particles, probably made in energetic processes long after the Big Bang. Positrons, like anti-protons, do not appear to originate from any hypothetical "antimatter" regions of the universe. On the contracy, there is no evidence of complex antimatter atomic nuclei, such as antihelium nuclei (i.e., anti-alpha particles), in cosmic rays. These are actively being searched for. A prototype of the AMS-02 designated AMS-01, was flown into space aboard the Space Shuttle Discovery on STS-91 in June 1998. By not detecting any antihelium at all, the AMS-01 established an upper limit of 1.1×10−6 for the antihelium to helium flux ratio. New research has dramatically increased the quantity of positrons that experimentalists can produce. Physicists at the Lawrence Livermore National Laboratory in California have used a short, ultra-intense laser to irradiate a millimetre-thick gold target and produce more than 100 billion positrons. Certain kinds of particle accelerator experiments involve colliding positrons and electrons at relativistic speeds. The high impact energy and the mutual annihilation of these matter/antimatter opposites create a fountain of diverse subatomic particles. Physicists study the results of these collisions to test theoretical predictions and to search for new kinds of particles. Gamma rays, emitted indirectly by a positron-emitting radionuclide (tracer), are detected in positron emission tomography (PET) scanners used in hospitals. PET scanners create detailed three-dimensional images of metabolic activity within the human body. An experimental tool called positron annihilation spectroscopy (PAS) is used in materials research to detect variations in density, defects, displacements, or even voids, within a solid material. ^ The fractional version's denominator is the inverse of the decimal value (along with its relative standard uncertainty of 4.2×10−10). Mohr, P.J. ; Taylor, B.N. ; Newell, D.B. (2006). "CODATA recommended values of the fundamental physical constants". "The NIST Reference on Constants, Units and Uncertainty". ^ P. A. M. Dirac. "The quantum theory of the electron". ^ P. A. M. Dirac. "A Theory of Electrons and Protons". ^ P. A. M. Dirac (1931). "Quantised Singularities in the Quantum Field". ^ Feynman, Richard (1949). "The Theory of Positrons". Physical Review 76 (76): 749. ^ Feynman, Richard (1965-12-11). The Development of the Space-Time View of Quantum Electrodynamics (Speech). Nobel Lecture. Retrieved 2007-01-02. ^ Nambu, Yoichiro (1950). "The Use of the Proper Time in Quantum Electrodynamics I". Progress in Theoretical Physics 5 (5): 82. ^ a b general chemistry. Taylor & Francis. 1943. p. 660. GGKEY:0PYLHBL5D4L. Retrieved 15 June 2011. ^ Cowan, Eugene (1982). "The Picture That Was Not Reversed". ^ a b Jagdish Mehra, Helmut Rechenberg (2000). The Historical Development of Quantum Theory, Volume 6: The Completion of. Quantum Mechanics 1926–1941.. Springer. p. 804. ^ Anderson, Carl D. (1933). "The Positive Electron". ^ "The Nobel Prize in Physics 1936". Retrieved 2010-01-21. ^ a b GILMER, PENNY J. (19 July 2011). "IRÈNE JOLIOT-CURIE, A NOBEL LAUREATE IN ARTIFICIAL RADIOACTIVITY". p. 8. Retrieved 13 July 2013. ^ "Antimatter caught streaming from thunderstorms on Earth". BBC. 11 January 2011. Archived from the original on 12 January 2011. Retrieved 11 January 2011. ^ Adriani, O.; Barbarino, G. C.; Bazilevskaya, G. A.; Bellotti, R.; Boezio, M.; Bogomolov, E. A.; Bongi, M.; Bonvicini, V.; Borisov, S.; Bottai, S.; Bruno, A.; Cafagna, F.; Campana, D.; Carbone, R.; Carlson, P.; Casolino, M.; Castellini, G.; Consiglio, L.; De Pascale, M. P.; De Santis, C.; De Simone, N.; Di Felice, V.; Galper, A. M.; Gillard, W.; Grishantseva, L.; Jerse, G.; Karelin, A. V.; Kheymits, M. D.; Koldashov, S. V.; Krutkov, S. Y. (2011). "The Discovery of Geomagnetically Trapped Cosmic-Ray Antiprotons". The Astrophysical Journal Letters 737 (2): L29. ^ Than, Ker (10 August 2011). "Antimatter Found Orbiting Earth—A First". ^ "What's the Matter with Antimatter?". ^ Winteringham, F. P. W; Effects, F.A.O. Standing Committee on Radiation, Land And Water Development Division, Food and Agriculture Organization of the United Nations (1989). Radioactive fallout in soils, crops and food: a background review. Food & Agriculture Org. p. 32. ^ Engelkemeir, DW; KF Flynn; LE Glendenin (1962). "Positron Emission in the Decay of K40". Physical Review 126 (5): 1818. ^ L. Accardo et al. (AMS Collaboration) (18 September 2014). "High Statistics Measurement of the Positron Fraction in Primary Cosmic Rays of 0.5–500 GeV with the Alpha Magnetic Spectrometer on the International Space Station". Physical Review Letters 113: 121101. ^ Schirber, Michael. "Synopsis: More Dark Matter Hints from Cosmic Rays?". American Physical Society. Retrieved 21 September 2014. ^ "New results from the Alpha Magnetic$Spectrometer on the International Space Station". AMS-02 at NASA. Retrieved 21 September 2014. ^ Aguilar, M.; Alberti, G.; Alpat, B.; Alvino, A.; Ambrosi, G.; Andeen, K.; Anderhub, H.; Arruda, L.; Azzarello, P.; Bachlechner, A.; Barao, F.; Baret, B.; Barrau, A.; Barrin, L.; Bartoloni, A.; Basara, L.; Basili, A.; Batalha, L.; Bates, J.; Battiston, R.; Bazo, J.; Becker, R.; Becker, U.; Behlmann, M.; Beischer, B.; Berdugo, J.; Berges, P.; Bertucci, B.; Bigongiari, G. et al. (2013). "First Result from the Alpha Magnetic Spectrometer on the International Space Station: Precision Measurement of the Positron Fraction in Primary Cosmic Rays of 0.5–350 GeV". Physical Review Letters 110 (14): 141102. ^ AMS Collaboration; Aguilar, M.; Alcaraz, J.; Allaby, J.; Alpat, B.; Ambrosi, G.; Anderhub, H.; Ao, L. et al. (August 2002). "The Alpha Magnetic Spectrometer (AMS) on the International Space Station: Part I – results from the test flight on the space shuttle". Physics Reports 366 (6): 331–405. ^ Bland, E. (1 December 2008). "Laser technique produces bevy of antimatter". ^ "Laser creates billions of antimatter particles". ^ Phelps, Michael E. (2006). PET: physics, instrumentation, and scanners. Springer. pp. 2–3. ^ "Introduction to Positron Research". Synopsis: Tabletop Particle Accelerator ... new tabletop method for generating electron-positron streams.